Mars as seen by NASA's Viking 1 orbiter. NASA has two teams of researchers working to design a robotic bee that can fly on Mars. The space agency announced the project on March 30. It's in its early stages, but the idea is to replace modern rovers — which are slow, bulky and very expensive — with swarms of sensor-studded, fast-moving micro-bots that can cover much more ground at a relatively low cost. Literally called Marsbees, the little bots are "flapping wing flyers of a bumblebee size with cicada-sized wings," NASA officials wrote. As Live Science has previously reported, the largest species of bumblebee grows to be up to 1.6 inches (4 centimeters) long, but the American bumblebee is about a quarter of that size. Cicada wings, according to a range of formal scientific descriptions, can vary from 1.2 inches (3 centimeters) to more than double that length, depending on the species. NASA hopes to send little bee bots flying over Mars. One reason this idea is at all feasible: Mars' low gravity. The planet has just one-third of Earth's gravitational pull, offering the Marsbees an advantage despite the thin atmosphere. 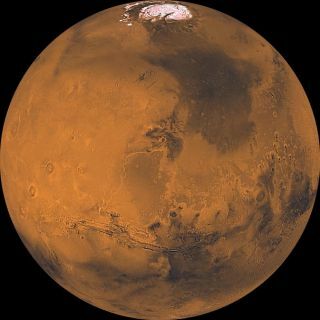 The Guardian reported that these "bees" will not only map the Martian terrain but also collect samples of the planet's thin air, in hopes of finding methane gas — a possible sign of life. NASA's Curiosity rover has detected low levels of the gas previously, Science reported, though whether it was biologically produced is unknown. Flapping-wing bots are pretty uncommon on Earth, the NASA statement noted, because rotary-wing bots like quadcopters are much more popular. But the flapping-wing design allows the team to integrate certain low-power, highly efficient technologies that will be important on the Red Planet, where the bots will have to return regularly to their home base to recharge. Marsbees are still in their very early stages, with a team at the University of Alabama, Huntsville working on numerical models and a Japanese team slated to design and test a micro-flapping-bot prototype. Editor's Note: This article has been corrected to reflect that the Marsbees team is based at University of Alabama, Huntsville, not University of Alabama.